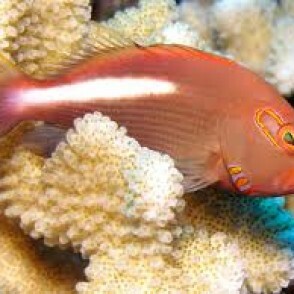 The Arc Eye Hawkfish, also known as Arc-Eyed Hawkfish, has an orange colored body with a white horizontal bar on the back half. 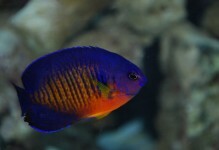 The operculum and eyes have the most distinctive markings, with an alternating blue and bright orange pattern. 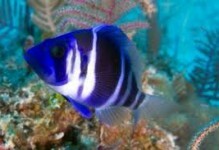 A 30 gallon or larger aquarium provides a good environment. 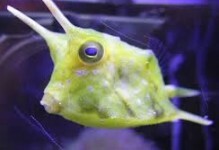 It should be the last fish introduced into the tank community. 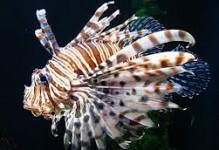 It becomes very territorial, and will harass new additions to the tank including other hawkfish and larger fish. 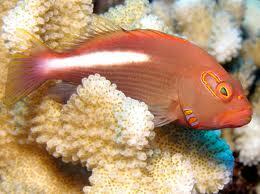 If placed in a reef aquarium, the Arc Eye Hawkfish will eat crabs, shrimp, anemones, and smaller fish.